Fish play a key role in the trophic dynamics of lakes. With climate warming, complex changes in fish assemblage structure may be expected owing to the direct effects of temperature and indirect effects of eutrophication, water level changes, stratification and salinisation. This means that warming will result in fish-mediated increase in eutrophication partly counteracting the effect of nutrient loading reduction. The response of fish to the warming in recent decades has been surprisingly strong, making fish ideal sentinels for detecting and documenting climate-induced modifications of freshwater ecosystems. An analysis of the effect on fish assemblages to climate change and climate variability has been conducted based on long-term (10 to 100 years) data series from 24 European lakes. These lakes constitute an appropriate and tractable sample of the world's lakes since many of them have been monitored more intensively and for a longer period of time than have most lakes elsewhere. Profound changes in fish assemblage composition, size and age structure were found during the last decades and a shift towards higher dominance of eurythermal species. The shift has occurred despite an overall reduction in nutrient loading that should have benefited the fish species typically inhabiting cold-water low-nutrient lakes and larger-sized individuals. The cold-stenothermic Arctic charr has been particularly affected and its abundance has decreased in the majority of the lakes where its presence was recorded. The harvest of cool-stenothermal trout has decreased substantially in two southern lakes. Vendace, whitefish and smelt has shown a different response depending on lake depth and latitude, with a drastic reduction in the Estonian Lake Peipsi. Perch was apparently stimulated in the north, with stronger year classes in warm years, but its abundance has declined in southern Lake Maggiore. Where introduced, roach now seems to take advantage of the higher temperature after years of low populations. Eurythermal species such as bream, pike-perch and shad are on the increase. The climate effects have overall been larger in shallow lakes. The fish assemblage is not only affected directly by warming and changes in the thermal stability of the lakes. Numerous recent studies and reviews indicate that warming will exacerbate existing eutrophication problems and this will in a self-amplifying manner further stimulate a shift to dominance of eurythermal species. They typically tolerate low oxygen levels and high ammonia concentrations and prevalence of small fish. A reduced ice cover period will enhance fish survival, with potential cascading effects within the food web, also reinforcing eutrophication. Therefore, we can expect an allied attack by eutrophication and warming in lakes in the future and the shifts in abundance, size and composition will be reinforced and stimulated by this process. Diatoms and macro invertebrates respond most strongly to general degradation already at low stress levels. This renders both organism groups weak indicators of local habitat improvement in degraded catchments, i.e. both groups are unlikely react to restoration unless broad-scale impacts are being remedied. Besides general and water quality degradation, fish and macro invertebrates respond most intensively to morphological degradation, structural modification and catchment land use. Fish respond strongly to hydrological degradation, too. Hence, river fauna reveals a more intense, but not necessarily more sensitive, responses to stress, compared to the flora. Overall, aquatic macrophytes were found to be comparatively weak indicators of the stressors considered. The most obvious alterations encompass a decline in cold-stenothermal species, in particular in shallow lakes, an increase in eurythermal species even in deep, stratified lakes. Several case studies show a decrease in the average size of the dominant species roach and perch. This also means that warming will result in a fish-mediated increase in eutrophication partly counteracting the effect of nutrient loading reduction. It also implies that it will be more difficult to obtain the good ecological status required by the WFD in lakes facing temperature changes due to global warming. The way to (partly) counteract the effect of warming is to reduce the nutrient input to lakes even further than planned under the present-day climate. The response of fish to warming during recent decades has therefore been surprisingly strong, making fish ideal sentinels for detecting and documenting climate-induced modifications of freshwater ecosystems. Jeppesen E., T. Mehner, I. J. Winfield, K. Kangur, J. Sarvala, D. Gerdeaux, M. Rask, H. J. Malmquist, K. Holmgren, P. Volta, S. Romo, R. Eckmann, A. Sandström, S. Blanco, A. Kangur, H. R. Stabo, M. Meerhoff, A.-M. Ventelä, M. Søndergaard, T. L. Lauridsen (submitted). Impacts of climate warming on lake fish assemblages: evidence from 24 European long-term data series. Surprisingly to many lake ecologists, zooplankton was not included as a biological quality element (BQE) in lake assessment according to the WFD - despite they are being considered to be an important and integrated component of the pelagic food web. Using contemporary and sediment samples from Danish, Estonian and UK lakes, and time series following changes in pressures (eutrophication and top-down control) it was shown that contemporary zooplankton (and cladoceran remnants in the upper sediment layer) has a strong indicator value. Moreover, zooplankton constitutes a cost-efficient indicator group capable of indicating the trophic state and ecological quality of lakes. In addition, zooplankton is important to measure the success or failure of management measures aiming at restoring lakes to good ecological status. Therefore, it is strongly recommended to include zooplankton, including cladoceran remnants in the surface sediment, as a central BQE in future WFD assessment and monitoring schemes. Using contemporary samples from numerous lakes in DK from mainly Denmark, Estonia and UK it is shown that zooplankton size structure, proportion of large zooplankton, cladoceran size and the zooolankton : phytoplankton biomass ratio are suitable indicators of "top-down" processes in lakes. Important indicators of "bottom-up" processes could be zooplankton biomass, the proportion of rotifers by numbers and the proportion of calanoid copepods of "bottom-up" processes. Combination of "top-down" and "bottom-up" indicator metrics might yield a solid assessment of trophic conditions in the pelagic of lakes. Time series for lakes in recovery from eutrophication as well as lakes restored by biomanipulation provide further evidence of the strength of zooplankton as strong indicators of changes in pressures. The paleoecological data presented suggest that sedimentary cladoceran assemblages are also sensitive to ecological change and are a relatively simple metric summarizing a combination of the benthic/pelagic balance of taxa, and size of remains as a measure of fish predation pressure could be a useful predictor of ecological quality. Further exercises are needed to develop metrics at the regional level throughout Europe as for other BQEs. So far, the most promising metrics based on contemporary samples are zooplankton biomass, the proportion of rotifers by numbers, the proportion of large zooplankton, zooplankton size, cladoceran size, and the proportion of calanoid copepods; and for surface sediment: size and the proportion of large forms of resting eggs and the proportion of pelagic cladoceran remains. The examples illustrate that zooplankton are important indicators of the structure and function of freshwater lake ecosystems and their ecological status. It is acknowledged, that zooplankton monitoring already today can be included in schemes of operational monitoring (for water bodies identified as being at risk of failing to meet their environmental objectives, and for those into which priority list substances are discharged), and investigative monitoring (if the reason for deviations is unknown, to ascertain the causes of a water body or water bodies failing to achieve the environmental objectives, or to ascertain the magnitude and impacts of accidental pollution). However, based on the experience from Denmark it is clear that the risk is very high (likely close to 100%) that policy makers and managers tend to follow a "minimum requirement" policy. We, therefore, strongly appeal to the relevant EU authorities to consider (and include) zooplankton as a BQE during the first revision of the monitoring programmes. We also see the omission of zooplankton as a loss of opportunity for transitional waters and large rivers. The focus mainly on ecosystem structure and less on function in the WFD must be reconsidered, and we have shown that zooplankton are a key element here for understanding lake ecosystem function - and perhaps also for large rivers and transitional waters. Jeppesen E., P. Nõges, T. A. Davidson, J. Haberman, T.Nõges, K. Blank, T.L. Lauridsen, M. Søndergaard, C. Sayer , R. Laugaste, L.S. Johansson ,R. Bjerring & S.L. Amsinck, 2011. Zooplankton as indicators in lakes - a plea for including zooplankton in the ecological quality assessment of lakes according to the European Water Framework Directive (WFD)- Hydrobiologia 676:270-297. Lake Pyhäjärvi, Finland: Good ecological status in terms of phytoplankton biomass can be achieved most efficiently by a reduction of external nutrient loads and fisheries management. Global warming will have an adverse effect, which can be compensated by further reduction in nutrient load. Lake Veluwe, the Netherlands: This case demonstrates that, when proper measures are taken to reduce both internal and external nutrient loads, shallow lakes may recover from eutrophication even when eutrophic conditions have lasted for decades. However, the recovery process may need a long time, even when ecosystem shifts are facilitated by human interventions (biomanipulation, eco-engineering, building with nature, eco-innovation). Aquatic macrophytes play an important role within the recovery process. In deeper lakes, this recovery process is more complex. Future increase in water temperature due to changing climate will have a significant impact on both ecosystem processes and species diversity and abundance. Total Maximum Daily Load (TMDL) criteria according to Reckhow (2001) for policy-relevant functioning of simple probabilistic lake models. Benchmark Models for the Water Framework Directive (BMW) criteria according to Saloranta et al. (2003) for technical standards of sophisticated hydrodynamic models. 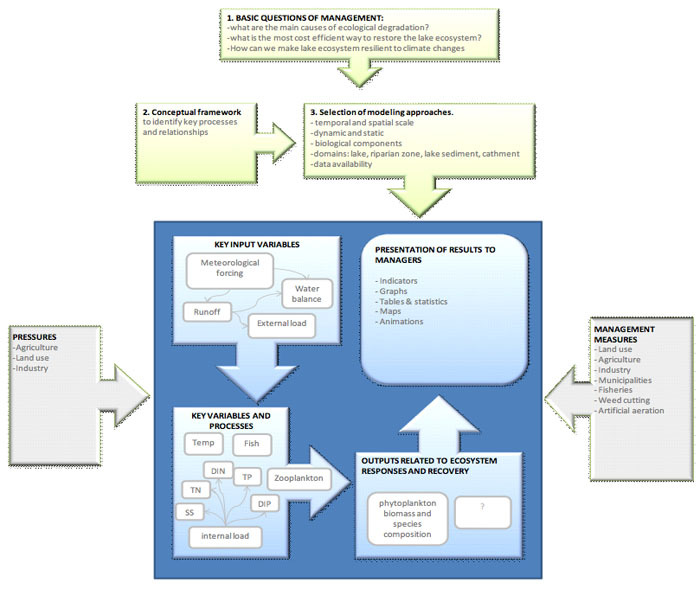 Harmonised Modelling Tools for Integrated Basin Management for implementing the Water Framework Directive (HarmoniQuA) according to Refsgaard et al. (2005) for communication between modeller and end user during the modelling process. The usability of case study models in design and decision making was evaluated with the good modeling practice (comparison of criteria of modelers and stakeholders) developed in the HARMONICA-project as described in WISER Deliverable 5.2-1: ”Analysis of applied modelling approaches in the case studies”. The feedback from stakeholders at Lake Pyhjärvi about models and their usage were gathered in a workshop. Lake and catchment models applied to the region were presented to the participants and resulting feedback was analyzed to formulate recommendations for model usage. A good modelling practice includes a stepwise procedure as indicated in Figure 1. The model development is guided by the pressures identified and the appropriate management measure(s) to mitigate its impact. This leads to the basic questions of management, the definition of a conceptual framework, the selection of the appropriate modelling approach and the identification of suitable key input and output variables and processes for modelling. More details can be derived from WISER Deliverable 5.2-1 "Analysis of applied modelling approaches in the case studies" and WISER Deliverable 5.2-3 (will be available soon) "Guidelines on the use of different modelling approaches for designing Program of Measures". Reckhow (chair) and others (Committee to assess the scientific basis of the total maximum daily load approach to water pollution reduction) (2001). Assessing the TMDL approach to water quality management. Report from Water science and technology board, Division on earth and life studies, National Research Council, National Academy Press, USA, pp. 68–102. Refsgaard, J.C., Henriksen, H.J., Harrar, W.G., Scholten, H. and Kassahun, A. (2005). Quality assurance in model based water management - review of existing practice and outline of new approaches. Environmental Modelling & Software 20, 1201–1215. Saloranta, T.M., Kämäri, J., Rekolainen, S. and Malve, O. (2003). Benchmark Criteria: A Tool for Selecting Appropriate Models in the Field of Water Management. Environmental Management 32, 322-333. How will assessment of ecological status and outcome of restoration be affected by climate change? How can uncertainties in assessment be quantified? These are two of WISER's key questions, which have been addressed in many of the project's deliverables and publications. However, the scientific results may not directly address the questions of river basin managers, such as "how will +2 °C temperature increase affect the probability of not achieving good ecological status?" For this purpose we have applied probabilistic modelling using Bayesian networks to summarise information on relationships between climate change, restoration, typology, pressure, biological response and ecological status class. Scientific evidence for climate impacts on different BQEs has been reported (e.g. Jeppesen et al. 2012). Here we present an example based on phytoplankton in lakes (chlorophyll a) and its response to increased temperature and reduced phosphorous (P) load (Figure 1). The relationships (including uncertainties) between climate, restoration, and total P in lakes is derived from mechanistic lake modelling (see Moe et al. 2012), while the relationships between temperature, Total P and biological response is derived from analysis of the WISER lakes phytoplankton data (Work package 3.1). Different scenarios have been explored by changing the probability distribution for "Climate change" and "Restoration", and recording the resulting change in probability distribution of "Status class". According to the phytoplankton indicator in this example, a climate change of +2 °C would almost counteract the benefit from 20% P load reduction, while +4 °C would more than outweigh the benefit from 40% P load reduction. the model predictions are directly relevant for risk assessment (e.g. probability of not achieving good ecological status). The model presented here can easily be extended to include more lake types, other biological quality elements and different scenarios, and the same modelling approach can be applied for rivers and coastal waters as well. Moe S.J. 2010. Bayesian Models in Assessment and Management. In Kaputska LA, Landis WG, eds, Environmental Risk Assessment and Management from a Landscape Perspective. John Wiley & Sons, Inc., Hoboken, NJ. Moe S.J., T. Saloranta, O. Malve, N. Kotamäki, A.L. Solheim. 2012. Climate change, restoration and ecological status in lakes: a Bayesian network modelling approach. WISER conference - Book of Abstracts. Nutrient assimilation capacities of European lakes were estimated using a large data set. The effect of climate warming on eutrophication proved to be positive. Thus, in warmer climatic conditions, an effective reduction of nutrients is needed to achieve a good ecological condition. A model was developed and included in the LakeLoadResponse (LLR) internet tool which can be used by water managers to estimate the reduction of nutrient load required at present and under changing climate conditions. 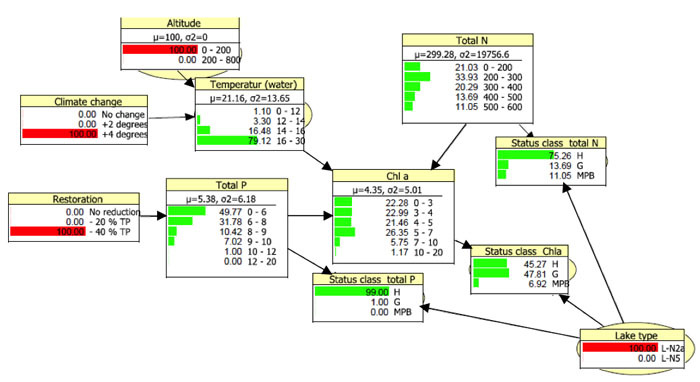 The linear mixed effects model is based on chlorophyll a data from 351 European lakes. The effect of total phosphorus, total nitrogen and water temperature on chlorophyll a concentrations varied among lake types, individual lakes within a type and individual samples within a lake. The amount of variation was significantly reduced using a linear mixed effects model for nested data. The statistical inference was based on a Bayesian approach thus giving a more realistic assessment of the effect of model uncertainty. The model is implemented in an internet tool and has been successfully used for the planning of restoration measures in Finland. Using the LLR tool, it is possible to test how the changes in water temperature affect the nutrient reduction required to achieve good ecological status. The LLR delivers predictions on water quality status with statistical confidence intervals to give more insight for the management actions. If combined with a map-based web service, the model can help water managers illustrate the forecasted effects in maps. For instance, the effect of fisheries management will be analyzed using extensive data from Finnish lakes in the GisBloom project (Life+ 2010-2013). A description of the mixed chlorophyll a model can be derived from WISER Deliverable 5.2-4: "Internet tool (model to assess target loads) for lake managers". Further instructions of the LLR internet tool and descriptions of the underlying models are available at LLR website. Throughout Europe the majority of lakes have been modified to some extent by human activity with agriculture and sewerage being the major contributors to eutrophication, most notably since the mid-twentieth century. As a consequence, higher algal productivity has lead to filtration problems for the water industry, oxygen depletion, recreational impairment, loss of biodiversity and an overall decline in habitat quality. Lake sediment analysis provides unique insights into the history of lake ecosystems, including evidence for the nature and timing of ecosystem change resulting from human impact. Palaeoecological methods can reveal pre-impact conditions as well as identifying any signs of recovery and have played a key role in the WFD in determining pre-enrichment reference conditions. Diatom records have proved especially valuable in this respect, largely due to their sensitivity to shifts in trophic status. In the absence of long-term chemical monitoring analysis of lake sediments can provide evidence not only of the pre-eutrophication baseline conditions, but also help track degradation and recovery pathways and thus provide a valuable tool for informing restoration programmes. Furthermore, where restoration programmes are underway, there is evidence that the recovery pathways are not simply a reverse of the degradation process and therefore indicate that other factors such as climate change may be influencing the rate and direction of recovery. Diatoms are a group of single-celled, microscopic algae, which preserve well in lake sediments due to their siliceous cell walls. Many diatom species are also very sensitive to changes in water quality thus, as the cells die and are laid down in lake sediments they provide a record of the environment within which they lived. By relating the fossil species to modern diatom assemblages collected across wide environmental gradients, very good estimates of past lake water chemistry can be inferred and an environmental history tracked down through the sediment record. With the application of radiometric dating, the timing and rate of changes can be determined and pre-impact (reference) conditions established. In many European lakes, diatoms have provided clear evidence that the onset of eutrophication was associated with changes in agricultural practice and urban development, particularly since the mid-twentieth century. Furthermore, where restoration programmes are underway it might be expected that the diatom record would show a reversal in the degradation pathway, but instead, diatom-based metrics often exhibit an alternative recovery pathway. This demonstrates that a reduction in one or more environmental stressors may not ultimately return a lake to reference conditions, but instead other processes such as internal nutrient loadings and climate change may determine the rate and direction of recovery. Lake sediments provide a valuable means by which reference conditions may be established in lakes. Furthermore, environmentally sensitive organisms such as diatoms may be used to determine both the degradation and the recovery process. In terms of lake management, while it is important to be able to identify baselines it should also be recognized that recovery may not simply be the reverse process of the degradation pathway and that the reference state may perhaps never be achievable in some lakes. The evidence suggests that recovery is more predictable in deep stratified lakes than shallow lakes, where top-down processes exert a major environmental control, but that in all cases the recovery process has a long way to go before reaching pre-impact conditions. This work highlights the important role that paleolimnological approaches can play in establishing a benchmark against which managers can evaluate the degree to which their restoration efforts are successful. Diatoms are just one of many biological groups preserved in sediments and by extending this work to use multiple assemblages it is possible to evaluate wider ecosystem responses to environmental stressors. These multi-proxy palaeoecological techniques therefore have an important role to play in assessing degradation and recovery pathways and informing lake management in order to satisfy the aims of the Water Framework Directive. WISER Deliverable 5.2-5: Bennion et al. in: "Report on effects of global change on reference conditions and ecological status of lakes". Bennion, H. and Battarbee, R.W. (2007) The European Union Water Framework Directive: opportunities for palaeolimnology. Journal of Paleolimnology, 38, 285-295. Bennion, H., Battarbee, R.W., Sayer, C.D., Simpson, G.L. and Davidson, T.A. (2011) Defining reference conditions and restoration targets for lake ecosystems using palaeolimnology: a synthesis. Journal of Paleolimnology, 45, 533-544. Bennion, H., Simpson, G.L., Anderson, N.J., Dong, X., Hobaeck, A., Guilizzoni, P., Marchetto, A., Sayer, C.D., Thies, H. and Tolotti. M. (2011) Defining ecological and chemical reference conditions and restoration targets for nine European lakes. Journal of Paleolimnology, 45, 415-431.